The Jung typing (like that in the MBTI ®) of your personality is based on four fundamental preferences. You decide what 'type' you are by answering honestly how you feel most comfortable within different situations... You say what you are like! Questions are posed to find your preference between two extremes. It is very rare for someone to be 100% one extreme or the other! Most of us are a mixture of the two. The test helps you to sort out what is your dominant factor. You are then given a percentage value for one of the letters that stand for the preference. All of us have mood swings that make our preferences alter slightly. If your preference for one type is only a small percentage (being a 'balanced' person) then you may find that on another occasion you change 'type' when ptaking the test. It is best to answer the questions in accordance with what would be your 'usual' frame of mind... not one in which you feel unusually hyper or unusually depressed. If you score a high percentage for a characteriostic it is unusual for that to ever change. Where does your primary source of energy come from... the outside world (activity and spoken words, others actions and thoughts triggering a response in you - like a catalyst to your thoughts) or inside yourself (your inner thoughts and emotions being affected very little by what goes on around - not responding to them)?. You will be given an E or an I letter. How do you prefer to take in information..... logically from physical evidence, using your five senses, weighing up all the facts, wanting details and evidence......... or intuitively - getting a 'feeling' for what is going on, looking at the 'big picture', wanting an overview rather than detail, preferring to form an idea or trend or pattern rather than go into minute detail, using your sixth sense - iNtuition? . You will be given an N or an S letter. Like clear and concrete information; dislike guessing when facts are "fuzzy"
Comfortable with ambiguous, fuzzy data and with guessing its meaning. How do you prefer to make decisions..... related to how they will affect others, how they will feel, based on your personal values or based on hard, cold facts, do you think being objective and detatched is best? Would you give a different answer to a particular question to a different person (F) or need to give the same objective answer even if it hurt them (T)? You will be given an F or a T letter. Instinctively search for facts and logic in a decision situation. Naturally notices tasks and work to be accomplished. Easily able to provide an objective and critical analysis. Accept conflict as a natural, normal part of relationships with people. Naturally sensitive to people needs and reactions. Naturally seek consensus and popular opinions. Unsettled by conflict; have almost a toxic reaction to disharmony. How do you prefer to organise your life.... structured (make snap decisions, Judgements, like timetables, action plans, like to know where you stand and where you are going) or flexible, hating routine, discovering life as you go along, thriving on challenge and last minute decisions on your Perception of the situation? You will be given a J or a P letter. Plan many of the details in advance before moving into action. Focus on task-related action; complete meaningful segments before moving on. Work best and avoid stress when able to keep ahead of deadlines. Naturally use targets, dates and standard routines to manage life. Comfortable moving into action without a plan; plan on-the-go. Like to multitask, have variety, mix work and play. Naturally tolerant of time pressure; work best close to the deadlines. The trick to 'self assessment questionnaires is to be honest'... and not to think too much about the questions... answer with your first impulse.... don't think about alternative situations/meanings........ and remember, your type is what you say you are! Learn from it, never use it as an excuse, but use explanations of how other types think/feel to help you understand how other folk think/react.... increase your empathy for others and understand yourself better! 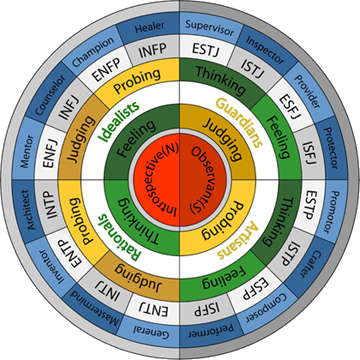 ® Myers Briggs Type Indicator and MBTI are registered trademarks of Consulting Psychologists Press Inc. Oxford Psycholgists Press Ltd has exclusive rights to the trademark in the UK. The brain and how it affects how we think and learn.